Is there a new SSD performance king? The Extreme Pro offers great performance and endurance, with a long 10-year warranty to back it up. It's reasonably affordable too. 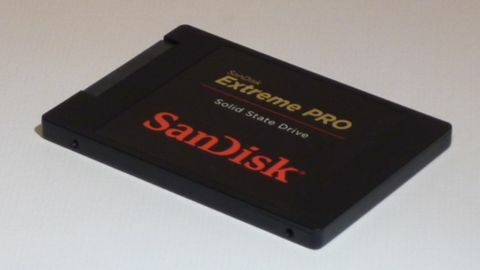 The SanDisk Extreme Pro is an update to last year's well-received Extreme II SSD. Priced at about £250 (around $390, AU$455) online, the Extreme Pro bears a few similarities, employing the same Marvell controller but with optimisations to the firmware for additional performance. The NAND has been upgraded to SanDisk's own faster second-generation 19nm MLC flash, with space reserved for not just the usual over-provisioning, but also nCache Pro tiered storage, with part of the drive treated as SLC flash. Coupled with excellent endurance and a 10-year warranty, which matches that of Samsung's similarly priced 850 Pro SSD, the Extreme Pro is a consumer SSD that's aiming for the very top of the performance leaderboard. SanDisk is a heavyweight in the flash memory industry, with decades of experience making storage for consumer electronics, including memory cards, USB sticks and embedded devices. Part of an elite list of companies which includes Toshiba, Micron and Samsung, SanDisk manufactures its own flash memory chips, and therefore could be described as an entirely vertical SSD company, but for one exception – it relies on third parties for the controller and software. In the case of the Extreme Pro SSD, that third party is Marvell, and the controller in question is a modified 88SS9187, the exact same eight-channel controller used in last year's Extreme II SSD. The firmware has seen some alterations though, which join a few other tweaks and changes that improve performance and longevity. Three capacities are available, with SanDisk following other firms in ditching its 120GB model, instead offering tiers at 240GB, 480GB and 960GB. In the box you get the drive itself, which measures 7mm high, in keeping with the smaller spaces available in some laptops. There's also a mounting bracket and a link to a software download of the SanDisk SSD Dashboard software, which allows for real-time diagnostics, viewing SMART data and firmware updates. Under the hood of the 480GB model are eight 64GB flash memory chips mounted on one side of the PCB, protected by thermal pads. Each memory chip is made of eight 64Gbit dies, built from SanDisk's second-generation 19nm 2-bit MLC flash memory. SanDisk has not yet deployed 3D NAND technology like Samsung's 3D V-NAND, but earlier this year the company announced a partnership with Toshiba to build a new fabrication plant in Japan focused on 3D NAND production. Notably missing on the Extreme Pro are capacitors for power-loss protection, as seen on some enterprise drives. This omission is however somewhat mitigated by the presence of nCache storage, SanDisk's proprietary caching technology. There's no hardware encryption either, something the majority of competing SSDs offer, although it's questionable whether many people take advantage of this. Like Samsung's TurboWrite employed on some of its SSDs, SanDisk's nCache is a caching technique where a portion of the flash memory is written to like SLC flash, with only a single bit written to each cell, which improves performance and longevity. Small writes are written to the cache first before being flushed to the main MLC portion of the drive in larger blocks. The total amount of space reserved for nCache isn't disclosed, but it's unlikely to be that much. There's 512MB of DDR3 memory cache used in the 240GB Extreme Pro as well, with 1GB in both the 480GB and 960GB models. Longevity is quoted as 80TB of writes in total, across all three capacities of Extreme Pro. While less than you might expect from an enterprise SSD, such as PNY's Prevail Elite, which quotes an obscene 1.5PB of writes, that is still a considerable amount of writes for a consumer drive, working out to almost 22GB a day over the ten-year warranty period, or 44GB a day over five years. Not at all bad. The 10-year warranty is also to be commended, matching Samsung's offering with its 850 Pro, and showing SSD firms are now really willing to back up their longevity claims with long warranty periods.